Preheat oven to 350 F. Line a muffin tin with 10 paper liners/wrappers. In a large bowl (or the bowl of a stand mixer fitted with paddle attachment), combine coconut and almond flours, salt and baking soda, whisking to combine. In a separate bowl, whisk together eggs, oil and honey until smooth. Whisk in orange zest. With the mixer running, slowly add the wet ingredients to the dry and mix until well blended. Stir in rosemary. Using a measuring cup, scoop 1/4 cup of batter into each lined muffin cup. Bake for 15-20 minutes or until a toothpick inserted into the center of the cupcakes comes out clean. 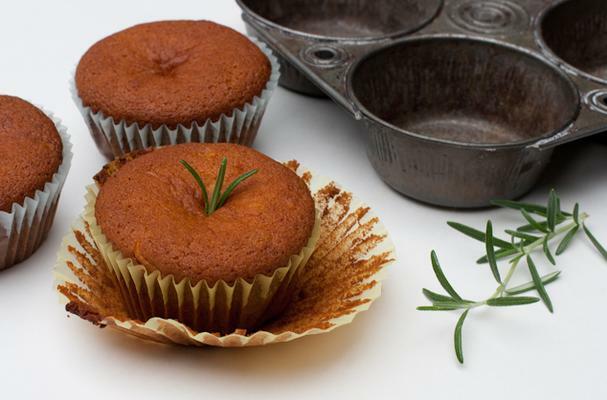 Allow cupcakes to cool in the muffin tin, then serve. Gluten free, dairy free. Adapted from Elana Amsterdam's recipe. Top with vanilla or orange buttercream frosting or leave 'em bald - either way, they're incredibly tasty!